The avionics OccFld includes direct and indirect support of all aviation weapon systems. While there is a large similarity in the skills required to provide this support, the systems being supported are diverse. The following examples are provided: direct support repair accomplished at the organizational maintenance activity (OMA) which is normally accomplished on aircraft, e.g., replacement of the radar antenna on the aircraft; indirect support-repair accomplished at the intermediate maintenance activity (IMA), which is normally accomplished off aircraft, e.g., radar system module repair, and repair/calibration of the radar support equipment. 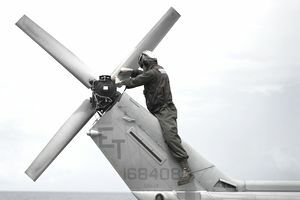 Marines entering the OccFld receive MOS 6300 for OMA, and MOS 6400 for IMA, Basic Avionics Marine, and then progress through specific hard skill MOSs and ultimately are assigned MOS 6391, Avionics Maintenance Chief. Qualifications initially include technical proficiency in the repair of one or more electronic systems after completion of formal training.